How long can cats go without eating? As a pet owner, you're probably worried sick every time your pet refuses to eat. Your concern is understandable - we’d be worried too. Loss of appetite in humans is an indicator that something is not right in their body, and the same may be true for cats. This condition can have many different causes, and we're going to go over as many of them as possible in this article. As a pet with a complex personality, a cat can stop eating for any number of reasons, and not all of them are a cause for concern. Understanding the underlying reason is not a trivial task. However, while doing so, it is important to stay calm, and not do anything drastic. So, How Long Can Cats Go Without Eating? ​For a pet - or any animal for that matter - to live and function properly, it needs proper nutrition. This means that a cat has to eat regularly. She also needs to drink water. It is important to note that a cat gets most of her water from the food she eats. You might want to keep tabs of your cat's intake, and if you notice that she doesn’t eat the food you give her, then it is time to check if your pet is eating elsewhere. If she isn’t, check if she is drinking water. A cat can live up to two weeks without eating as long as she is still drinking water. But if the cat is also not drinking water, she won’t live for more than a few days. And also remember not eating for a day or two can have a negative and permanent damage that may plague them for the rest of their lives. If your cat is not eating nor drinking for more that 24 to 36 hours, bring her immediately to the vet for a check up. One major difference between a cat not eating and a cat not drinking water is the damage it can do to your pet's internal organs. Any animal not eating for days will gradually lose energy and nutrients required to function. Once they have eaten, they can very easily get back to their old self. ​In contrast, an animal that does not drink water will not only fail to function but will also experience internal organ damage. Water is important for the function of all the organs in the body. Dehydration damages the kidneys, and liver and other organs. Extended periods without drinking water will cause these organs to have long term damage and eventually, death. ​In case, there is no food or water, the first to shut down is the stomach, and then the kidneys, and the liver. The last to go would be the heart and then the brain. Irreparable damage can be done to these organs if your pet does not eat or drink. What to Do if Your Cat Stops Eating? ​Bringing your cat to the vet is the first thing you need to do. The vet would treat this as an emergency and will start treatment by attaching a fluid drip to quickly rehydrate your cat’s body. ​After an initial examination, and being sure that the cat does not have any injuries, the vet will recommend admitting your pet so she can be properly treated. In case a vet is not available, you have to find ways to feed your cat and ensure she is drinking water. Using a dropper, you can feed her water in regular intervals. You can also give her much-needed nutrients by feeding her soft foods. What are your pet’s favorite foods? Tuna? Biscuits? This might not be enough for a solid meal, however, but it can help nurse your pet until she becomes healthy again. You can even try giving her tuna water – it seems to work in rehydrating a cat without food. A cat is a complex animal and it is not entirely uncommon for pet owners to lament and say “my cat is not eating”. There are a lot of possible causes for her refusal to eat. One reason, as mentioned earlier, is a health problem. She may be hurt or sick. This can be anything from an injury to a simple case of indigestion. It can also be a symptom of diabetes. Some cats even experience what’s called feline depression. Whatever it is, only a vet can tell for sure. If your cat does not have any appetite at all, you should have at least some idea why she’s acting like that. There are some things you can try such as giving her a cat food or switching to another brand of cat food. Or perhaps she might also need a change of scenery, or anything that might help to make her feel motivated. ​There are a lot of different cat food products available in the market. You can introduce your pet to as many of these products as possible and see which ones she likes. ​It may require some trial and error, and let me just warn you, it might take some time. Moreover, your cat's personality should also be taken into consideration, and she should be given some time to get acquainted with the new flavors. ​It is also worth noting that after a long time of being on the same diet, it may be that it has dulled the cat's taste which is exactly why you should consider giving her another kind of food or perhaps just buying another brand. One long term damage is fatty liver disease or hepatic lipidosis (HL). When a cat’s body does not have enough water or if she does not eat for an extended period of time, she may become susceptible to acquiring HL. A larger or fatter cat would be more prone to it, as the body loses weight, the first to go would be fat and liver fat would not be affected. This may cause an imbalance in the body and eventually lead to the onset of the disease. Only a vet can determine this for sure, by means of a liver biopsy. There are several reasons why cats don't eat. It could be because of depression, or your cat may just be looking for variety in her diet. If after trying something new, your pet is still not interested in food, it may be time to bring her to the vet for a checkup and tests. Your pet may have diabetes, liver problem, or a heart condition. Either way, only lab tests and scans can confirm your suspicion. ​The important thing is to be observant and try to be as responsive as you can to your pet’s needs. The sooner you spot the signs and symptoms the better, so your cat can receive treatment as soon as possible and thus prevent any further damage to her body. Best Wet Cat Food (BENEFITS + REVIEWS) That Cats Will Love! I cant believe that throughout this article that there was only one mention of teeth being a reason for not eating. Periodontal disease is the most common cause of death after illness in mostly elderly cats and sometimes in younger cats. If it hurts to chew their food they will avoid anything to do w/that pain or what causes it. Hey, I just wanted to thank whoever posted this. One of my cats has been meowing for a day now. Although there is always fresh water, this cat rarely drinks from it. I do however usually give them some sort of saucy food which I supplement with roasted chicken which they love. I knew something was wrong when he wouldn’t eat the chicken (dry white meat) and the prior meal had been a pate’ which also doesn’t have a great deal of liquid. After reading the above, I simply added a little water to it and wallah, he scarfed it down after licking up all the “sauce”. Now i understand why FF sells their broth. I figure in the future a can of Chicken broth will become a regular for both my cats plus more “wet” food with gravy or sauce. Thanks for the insightful input. I did edit the article to make it more clear that they should take their cats to the vet if it has not eaten between 24-36 hrs. And I also did state that there can be long lasting permanent damage to their cats body if it has not eaten for the said period. A cat can not go two weeks with out eating. They will get Hepatic Lipidosis or fatty liver disease quickly as two days ..
this is were the body attacks the fat in the liver for engery .. this results in more sickness now causing the cat to not eat because the HL is making them feel sick. Please research Hepatic Lipidosis or fatty liver disease. Even if they start eating and get better there are permanent effects it can have on them. Saying two weeks is misleading. I know HL is mentioned here but most people will not read that far once they get there a answer of “2 eeekd” they might be “alive” but in what condition and with what possibility of recovery .. If ur cat has not ate anything in 24/36 hour get them to vet right away. If you are worrying that your cat is not eating the best thing to do is to take him/her to the vet again. and explain to them what happened before your first visit and what happened afterwards. they are the only one’s who can give a clear diagnosis of what is happening to your cat. hope this helps. We took our it tabby cat to the vet yesterday. Dr. Said he had heart problems. She gave him a shot and medication. He can’t walk and he rolled off the bed to the hard hardware floor prior to the vet visit. His eyes look good but he is very uncomfortable. He drinks water but he won’t eat anything. Do u have any suggestion? We’re so worried. 11 Cat Breeds That Get Along With Dogs? Its True!!! The Complete First Time Cat Owner Checklist!!! 7 Best Healthy Cat Treats for your Lovely Cats!!! 6 of the Best Cat Dental Treats to Keep your Cat’s Teeth Healthy!!! Catguy on Why Do Cats Eat GRASS? Is It GOOD or BAD for Them? Sophie on Why Do Cats Eat GRASS? Is It GOOD or BAD for Them? 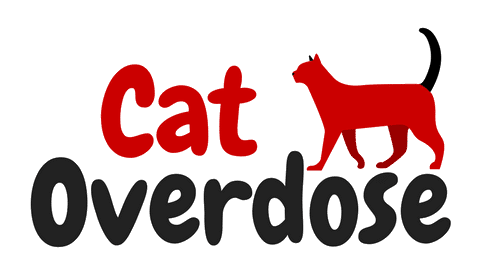 Catoverdose.com is a participant in the Amazon Services LLC Associates Program, an affiliate advertising program designed to provide a means for sites to earn advertising fees by advertising and linking to Amazon.com. Additionally, Catoverdose.com participates in various other affiliate programs, and we sometimes get a commission through purchases made through our links.